Ecuador's Luis Bolanos struck a 10-minute hat-trick to give Internacional a 3-0 home win over Coritiba and a share of top place in the Brazilian Championship. Inter, who had lost their previous three matches in all competitions and not won in six, rested several key players for Wednesday's second leg of the Copa Brasil against Corinthians, in which they are 2-0 down. 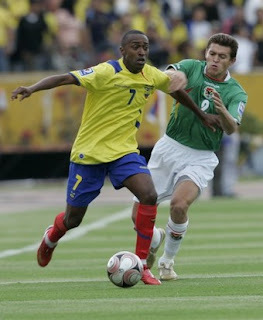 Bolanos, formerly with 2008 Libertadores Cup winners LDU of Ecuador, opened the scoring 18 minutes into the second half of Sunday's match after beating three defenders. Six minutes later, he tapped in the second after an incursion from the right by Alecsandro, and completed his hat-trick with a low shot. "I've been looking for opportunities (to play) and it's very good to score goals," Bolanos told reporters. "I'm grateful to (coach) Tite for the chance to play." Copa Sudamericana holders Inter, who had last tasted victory on May 31, also lost the first leg of the South American Supercup 1-0 against LDU midweek. Corinthians also rested players including Ronaldo and lost 1-0 away to Atletico Paranaense. Palmeiras, in their first match since coach Vandeleri Luxemburgo was sacked earlier in the weekend, drew 1-1 at home with Santos in a regional "classic". They went ahead through striker Obina, playing in place of Keirrison whose removal from the squad during transfer talks with Barcelona sparked the row between Luxemburgo and the Palmeiras management that led to the coach's sacking. Substitute Robson equalised for the visitors nine minutes from time. Former Monaco coach Ricardo Gomes made a winning debut in charge of title holders Sao Paulo, whose 2-0 home victory over Nautico on Saturday was only their second in eight matches. Brazil midfielder Hernanes, returning to the team as captain after being dropped by sacked coach Muricy Ramalho, scored one goal and laid on the other for Jean Roth. Adriano's Flamengo drew 0-0 with Fluminense at the Maracana in a Rio de Janeiro derby.